For me, the PEN World Voices Festival is one of the high points of my year in New York City. It brings together writers in the United States and around the world, including writers for young readers and translators, to talk about the intersection of literature and politics. Through the World Voices Festival, I’ve gotten to know the work of new writers and reconnected with old friends. 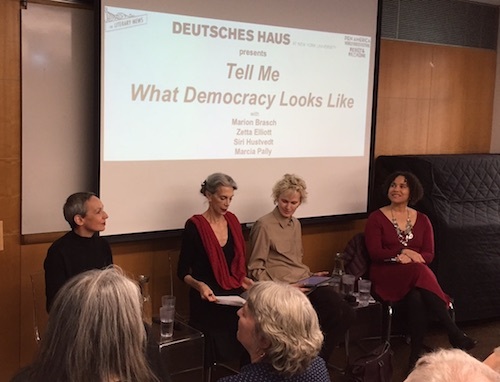 The panelists, from left, Marion Brasch, Marcia Pally, Siri Hustvedt, Zetta Elliott. For years I’ve recommended Zetta Elliott as a World Voices Festival panelist because she’s one of the smartest people I know and her work as an author and advocate is exactly what PEN does, or should be doing. This year, she spoke at a Friday evening panel at Deutsches Haus on the NYU campus on a panel titled “Tell Me What Democracy Looks Like,” along with author Marion Brasch, the current writer-in-residence at Deutsches Haus; novelist and essayist Siri Hustvedt, who writes extensively about neurology and psychiatry; and moderator Marcia Pally, professor of theology and multicultural studies at NYU, Fordham University, and Humboldt University in Berlin. The panel began with short statements from each of the authors. Brasch talked about growing up in East Berlin under Communism, how the promise of democratic socialism morphed into a repressive police state and how the promise of reunification ended in East Germany being handed over to the West without any effort to draw from the best of both systems. The result has been a predatory form of capitalism — more evident in the United States than in Europe — and the rise of right-wing extremism — more evident in Germany where, unlike in the U.S., there seems to be little overt protest to the rise of the Right. Hustvedt talked about being part of the 2017 women’s march while thinking that 100 years ago, women lacked the right to vote and Jim Crow and the Ku Klux Klan were ascendant. She didn’t mean that we’re necessarily in a better situation today but rather that the forces of white male supremacy and oppression are an “old American song.” While the country grew out of the values of the Enlightenment, the Enlightenment of the Founding Fathers was one of privilege built on exclusion, exploitation, and expropriation. While the U.S. is built on the myth of the lone hero, democracy, in fact, requires community and mutual dependence, in which the rights of minorities are protected from those with superior numbers and power. Zetta Elliott shows her slides. 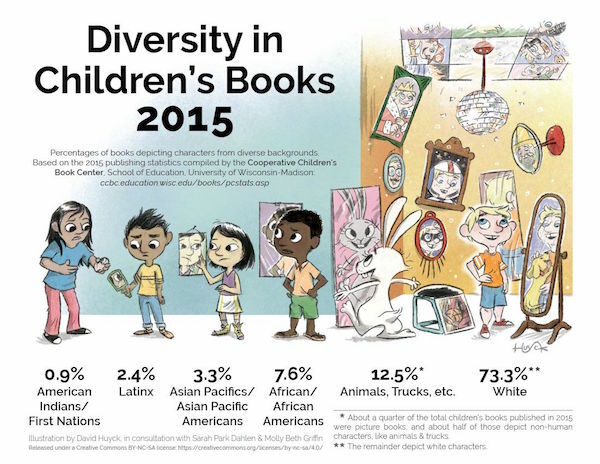 Elliott came with her PowerPoint illustrating the overrepresentation of white protagonists in children’s books, the overrepresentation of white authors even when they’re writing about people of color, and the predominantly white, cishet, able-bodied publishing industry. She noted that children’s publishing is made up overwhelmingly of white women and observed that a majority of white women voted for Donald Trump in 2016. In other words, “white women need to do better” as allies. Referring to books for young readers, she introduced Rudine Sims’s concept of mirror books reflecting the reader, window books allowing the reader to see another culture and way of life, and sliding glass door books that build empathy and bring readers together to share their experiences. She chastised a publishing industry that presents only a “single story,” in the words of award-winning author Chimamanda Ngozi Adichie; today, that single story in YA publishing is that of the inner-city Black boy shot by a police officer. Moderator Pally asked the three panelists about what she’s seen as a “pure us against them” mentality nurtured by the Right, and whether “we’re essentializing them the way they do us.” Brasch expressed confusion at why people support the far-right German party AfD. Hustvedt talked about tribalism that emerges in historical moments. She said one can identify ideas as pernicious without demonizing the people who hold them. Elliott disagreed with much of this. She said that people of color were not surprised that Trump was elected because his supporters have existed for a long time. There is no point in trying to reason with a Trump supporter. Rather, it’s important to reaffirm the humanity of people of color, LGBTQ+ people, and disabled people. She suggested that a way of appealing to whites on the left is not to label and turn away from “identity politics” but rather to speak about intersectionality. “The core of rage is pain,” she said, and victims can become victimizers out of pain and a desire to maintain what privilege their whiteness gives them. Both she and Hustvedt criticized the media for giving disproportionate attention to Rust Belt whites who voted for Trump. Most of his voters were wealthy, Hustvedt said. And white people need to confront and talk about their whiteness. At this point, the moderator opened the floor to questions from the more than 100 people in the audience. It’s a law that the larger the audience, the fewer the number of questions, but a few brave souls stepped forward to ask questions in groups of three. The first three questions addressed mistreatment of mentally ill and HIV-positive people (here, intersectionality comes into play), how we can have a democracy when the media engage in exclusion and manipulation of public opinion as exemplified by the publishing industry, and how both fear and demographic changes contribute to the loss of democracy. As a volunteer in a psychiatric hospital and writer on the subject, Hustvedt talked about mental illness and the power of storytelling to help people. She also noted that unequal societies like the U.S. are sicker societies than those with more equality. Elliott seconded the importance of storytelling and talked about how self-publishing has served as a means for excluded and marginalized writers to get their stories out into the world. She described how difficult it was to find reviewers for her dozens of self-published books, but the bloggers came through where the industry publications didn’t. She urged the audience to read more blogs (yay, blogs!) and to use the internet to find and amplify alternative voices to the corporate media. In the second round of questions, audience members asked if the writers feared career repercussions because of their activism, and the way Americans lie to themselves. Though seemingly disparate, Elliott managed to combine those questions into one powerful answer by observing that “meritocracy is a myth.” The United States was founded on a master narrative of meritocracy that concealed “stolen land and stolen people.” She pointed out that failure in a mythical meritocracy leads to people projecting their anger onto immigrants, people of color, and minorities. She called on us to write narratives that heal rather than oppress and polarize. Hustvedt gave a concrete example of this ideology of individualism and meritocracy, the dominant narrative of the “self-made man.” In talking to chronically unemployed men, she noticed how all of them listed their profession as “consultant,” even though they weren’t “consulting” on anything for anyone. They would not admit they were unemployed because it meant they were failures. 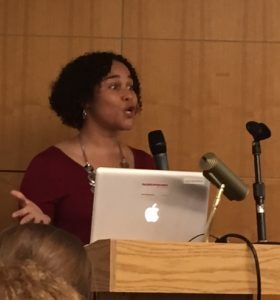 The panel garnered an enthusiastic response, and based on the number of people lining up to speak to Zetta Elliott afterward, it seemed that few of them had been aware of the racial disparities in children’s publishing. They expressed concern because of the effect of an all-white literary world, along with the perpetuation of racial and ethnic stereotypes, on a new generation that could internalize the ethno-nationalist orientation of the current leadership, or grow up knowing the stories and making the cross-cultural connections to bring about a more just and inclusive world. Thank you for the great write up! Sounds like a tremendous panel. Thank you, Charlotte! I’m writing up two more panels later this week, one organized by the PEN Children’s Committee with Tonya Bolden, Wade Hudson, Eric Velázquez, and Innosanto Nagara, and a discussion of “It Can’t Happen Here,” (or can it?) with Masha Gessen, Max Boot, and Ian Buruma. Great post, Lyn! Sounds like some great points were made at this festival as usual. Yes! And more to come!